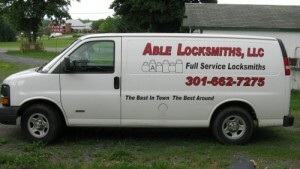 If you are looking for professional locksmith services for your car, motorcycle, ATV, boat, campers / RV’s, tool boxes, automotive carriers, truck caps, commercial-use trucks and more, then look no further than Able Locksmiths, LLC. Our highly trained and certified technicians are experienced in working with a wide range of domestic and foreign automobile manufacturers. Lost your keys? No problem! We can generate keys from scratch. If you are locked out, our technicians will professionally and efficiently unlock your vehicle without damaging it. Give us a call at 301-662-7275 for Emergency Service and After Hours Services or to speak to our friendly staff today! We are still working when our show room is closed! If a child is locked inside of your vehicle, call us immediately! We will unlock the vehicle without damaging it, free of charge. We stock over 100,000 key blanks in our shop. Give us a call at 301-662-7275 for Emergency Service or to speak to our friendly staff today!